Redise Cloud is a fully-managed cloud service for hosting and running your Redis dataset in a highly-available and scalable manner, with predictable and stable top performance. You can quickly and easily get your apps up and running with Redise Cloud through its add-on for Heroku, just tell us how much memory you need and get started instantly with your first Redis database. You can then add more Redis databases (each running in a dedicated process, in a non-blocking manner) and increase or decrease the memory size of your plan without affecting your existing data. Redise Cloud offers true high-availability with its in-memory dataset replication and instant auto-failover mechanism, combined with its fast storage engine. You can easily import an existing dataset to any of your Redise Cloud databases, from your S3 account or from any other Redis server. Daily backups are performed automatically and in addition, you can backup your dataset manually at any given time. The service guarantees high performance, as if you were running the strongest cloud instances. Once Redise Cloud has been added, you will notice a REDISCLOUD_URL config vars in your heroku config containing the username, password, hostname and port of your first Redis Cloud database. Next, setup your app to start using the Redise Cloud add-on. In the following sections we have documented the interfaces with several languages and frameworks supported by Heroku. The redis-rb is a very stable and mature redis client and the easiest way to access Redis from Ruby. No special setup is required when using Redise Cloud with a Unicorn server. Users running Rails apps on Unicorn should follow the instructions in the Configuring Redis from Rails section and users running Sinatra apps on Unicorn should follow the instructions in the Configuring Redis on Sinatra section. A Sinatra sample application is available at GitHub. // URI couldn't be parsed. A Java sample application, running on Play!, is available at GitHub. redis-py is the most common client to access Redis from Python. Redis can be used as the back-end cache for Django. A Django sample application is available at GitHub. A PHP sample application is available at GitHub. A Node.js sample application is available at GitHub. You can then find your dashboard under the MY DATABASES menu. 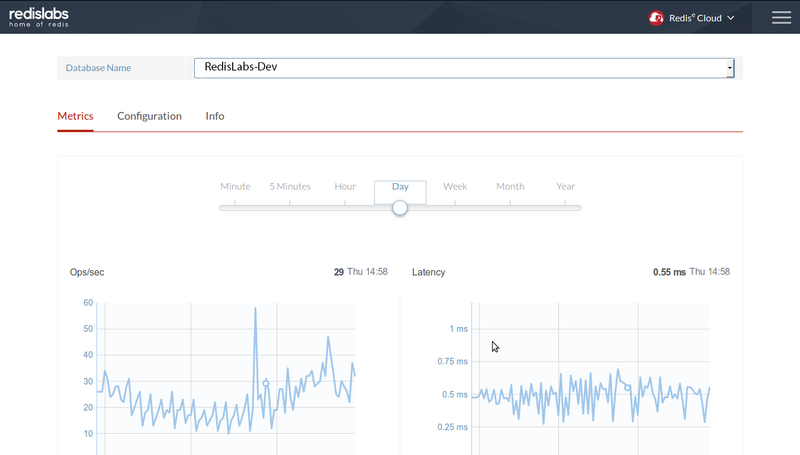 Alternatively, open the Redise Cloud add-on from your application’s dashboard at heroku.com. You can access the backups of your database from our dashboard via the MY DATABASES > Manage menu. After you select a database from that page, use the Backup Now button to create an on-demand backup or the My Backups link for a list of links to your database’s backup files. Backups are available only for paid plans. Note that backups are available only on paid plans. Change MYREDIS_URL in this example to the config var that contains your existing Redis connection URL. Redise Cloud allows you to add multiple Redis databases to your plan, each running in a dedicated process, in a non-blocking manner (i.e. without interfering with your other databases). You can create as many databases as you need, limited by the memory size of your plan. Your first Redis database is created automatically upon launching the Redise Cloud add-on and its URL and credentials are maintained in REDISCLOUD_URLconfig vars. To add more databases, simply access your Redise Cloud console and click the New DB button in the MY DATABASES > Manage page. The Redise Cloud console will provide you a new URL for connecting to your new Redis database. This will destroy all associated data and cannot be reversed! All Redise Cloud support and runtime issues should be submitted via the Heroku Support channels. We recommend CC:ing support@redislabs.com for urgent issues. We are also available on twitter @RedisLabs.